One of these bands showed up here on Saturday afternoon. It was the most vivid I’ve seen and, like this one, beautiful. It’s neat that you were able to catch the almost invisible cirrus clouds that provided the canvas for the color. Yes, I lucked out with the combination of cloud types, especially the cirrus. What a coincidence that a local reader of yours saw “that cool rainbow-like thing” that you’d also seen. Do you know whether that reader managed to photograph it? Occasionally the ubiquitous smart phone will do, but other times it’s not good enough. Eve encourages me to bring my camera bag along even when we’re going somewhere where I’m unlikely to want to take pictures. Sometimes I do and sometimes I don’t. Yesterday was a don’t, when we passed a group of vultures. Fortunately we were only a couple of miles from home, so I retrieved my camera bag and found the vultures still there when I made it back to the place where we’d seen them. She did manage a couple of photos with her phone. For some reason the colors in her photos are less intense than when I saw it, but any number of things could account for that. We live so close (she’s on the other side of the lighthouse) that we often end up making photos of the same clouds, sunsets, and so on. It’s great fun to compare notes. Thanks for your link to those two pictures. As you say, lots of things could account for differences in how the two of you perceived the phenomenon, including whether the blog versions of the photographs accurately display what she saw. I didn’t know the two of you live so close to each other; that can definitely make for interesting comparisons. I very much enjoy your photographs, and hers; and thank you both. 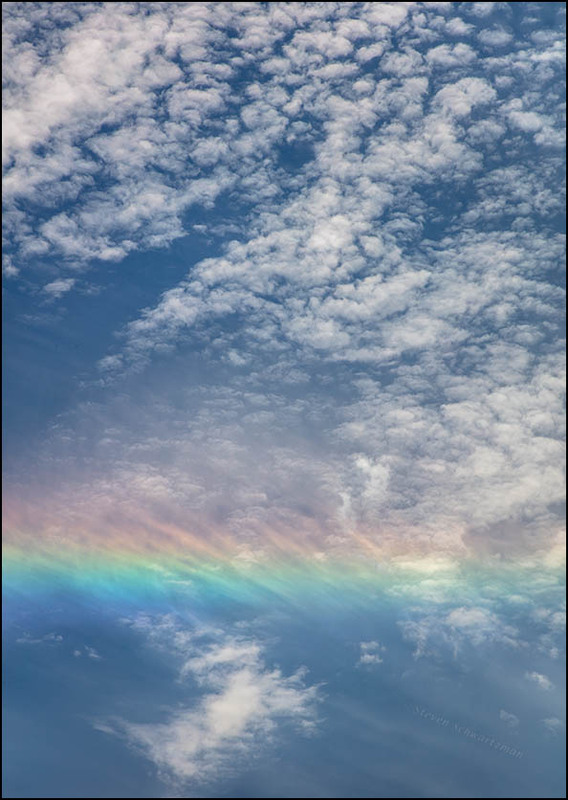 Thanks for your comment and for your link to the article about what I now see is called a circumhorizon arc (which for lack of the correct terminology I called a prismatic band). A few pictures of that phenomenon came as a welcome and unanticipated bonus from my visit to photograph the geology at Hopewell Rocks. I’m glad you’re enjoying the photographs you see here and on the two blogs that shoreacres publishes. Your photo proves the point that it is always worth looking up. Right you are. Things were looking up. True, a rare and welcome sight. I am always amazed at what we can see either looking up, or down… or to the right or left. Something grand or exceptional can be missed in the blink of an eye! And because as we walk along we can’t look in all possible directions, I’ve come to accept as an article of faith that I must have missed many worthy things in my rambles in nature. One experience I’ve had a bunch of times serves as a confirmation of that. From time to time I return from a jaunt into nature along the same path I followed on my way out, and sometimes on the way back I’ve noticed something I’d walked right past without seeing it the first time. Occasionally it’s even been something prominent right at the edge of the path. I’ve had that happen too. Even picking cockleburs (I’m back at it this year) – I walk one direction and go back from where I came and find all sorts of plants I missed! Just goes to show sometimes it’s about looking at something from a different angle or light. Agreed: an alternate perspective can make a big difference.